It has just occurred to me that there is another way of controlling the runaway clockwork loco. Small engine policy and associated double heading, #57 looks pretty neat when paired with #5. The Porter should hold the clockwork loco in check, but #57 is not just along for the ride and will assist with pulling the train uphill. Yep, that works. I can even get the train to a stop at stations using #5 to brake #57. The clockwork loco has enough adhesion not to slip when it is brought to a stand but not enough strength to drag the electric loco when the power is turned off. Looks as if #57 and #5 will be seen together again. There's a nasty wobble on #57's tender as it is under tension between the two locos. I might fit it on a four wheeled chassis again. Like the new addition to the railroad's "livestock", Bob. Here on the FC Este we have El Limon Volante (the Flying Lemon) to work the Mail service. Model Power diesel switcher mechanism and most of a Gnomy delivery van, with a more square freight compartment from styrene, but using the Gnomy doors. 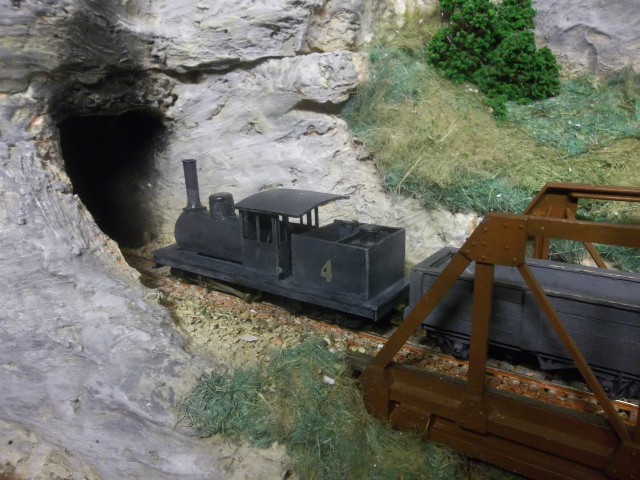 Looking at the Ruston pictures, there's an open wagon behind the loco with a load that looks as if it's been carved from balsa, but the details are not clear (or is it my eyesight?). Are they sacks? In any case it has given me an idea to play with. Not sacks in the wagon behind the loco, bales. The wagon at the loading dock has got sacks in it. These wagon loads are designed for OO but are, in my opinion, a bit too big and better suited for the senior scale. 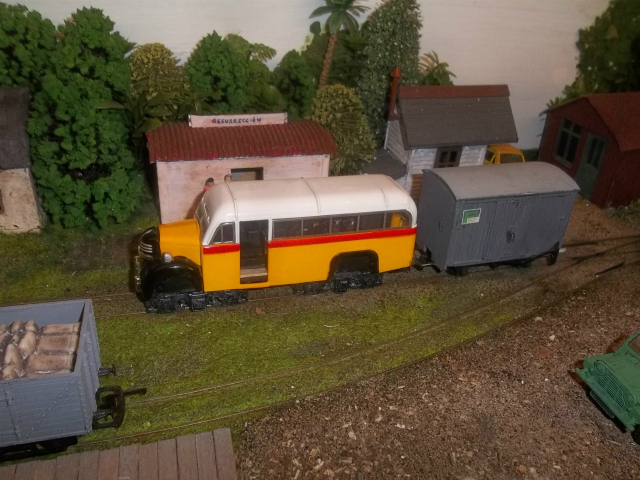 Shown below with one of my widened OO to On30 conversion wagons. I bought them at a toyfair in Crewe some years ago. There was a trader at the same event last month selling the similar items, not a clue who he is and whether or not he trades elsewhere, sorry. They are resin castings, probably made from moulds taken from either hand made originals or pirated from commercially made products, though apart from that I cannot say much more about them. Not sacks in the wagon behind the loco, bales. OK; I'm mainly interested in the general shape. I've made an experimental piece from a scrap of balsa, carved to shape and then covered with Kleenex tissue, soaked in button polish to stiffen it. If it looks OK when painted I'll post a picture, and make a bigger block to fill a wagon. Under a tarpaulin it could be anything that needs protection from the elements. Oil drums, wooden crates and barrels can easily be modelled this way without the need for fine details. Another good trick with a tarp is to stretch it over an open wagon instead of a flatcar. You can have a rough outline of a load under it and hollows can be filled with "water" to show that the cover is keeping the weather out. This standard gauge O scale open has had a tarp on it for about nine years now and the water really needs changing! It's varnish poured into the dip in the wagon sheet, which is tissue paper dosed with diluted PVA. The green lump in the second photo is just a block of wood with tissue paper over it, again dosed with diluted PVA and of the same vintage. All of the above would be improved if the sheets were roped down to stop them blowing off! I like the new water crane at Puerto del Sastra; clever use of a...? What was it??? Finding a new use for those bits and pieces meant for something else entirely is one of the joys of modelling and perhaps particularly suited to the larger scales. For instance, the pump on a hand-wash dispenser contains a moulding that is almost perfect for use as a vertical boiler - just right for a donkey engine in a logging camp, or perhaps a small steam crane. The "cast iron" head and the hose are from a small plastic bottle with a pump on top. Not a clue what it had in it, I found it on my way to work. It contained a minty smelling liquid (which I poured down the loo). The column is the barrel of a felt tip laundry marker, the grid is a brass window etching, the tap is an O scale buffer and the rest of it is just left-over bits of styrene. 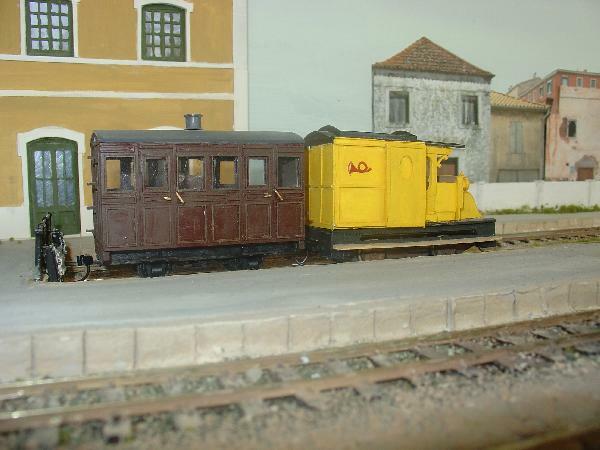 Forney No.4 on this morning's 5am freight from Cuarto de Pulgada to Ciudad Grande. Very nice, Bob. It just had to be #4, didn't it? Ebay (look in the toys and games bit instead of model railways). Ah! I've been a bit too busy this last week-end unloading a lot of my less-needed bits and pieces. And buying some items as well, mainly buffers and wheel-sets to upgrade some of my "penny dreadful" models, plus one or two for Shellsea. The bus has arrived, been cut up, and begun its new life as a train.